The Nuna Pepp is a small but perfectly formed pushchair. It has everything you could need and more. 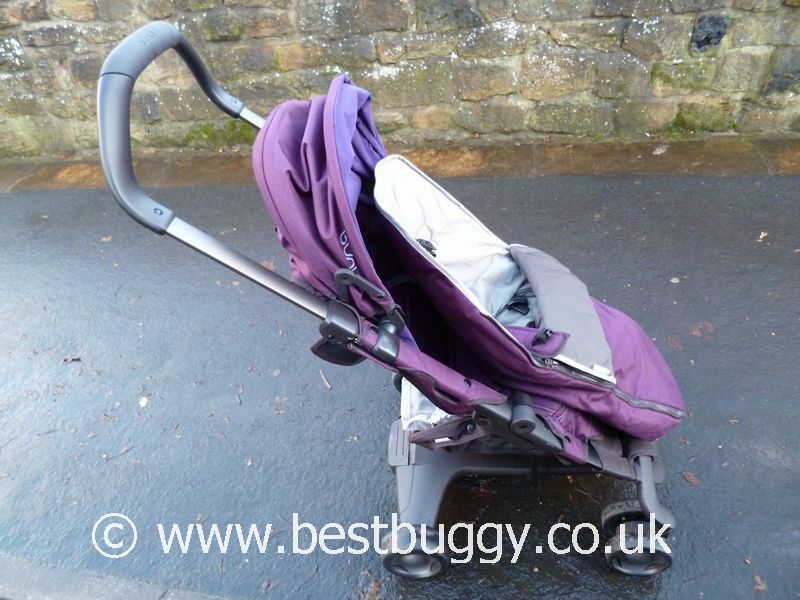 The Nuna Pepp is one of the neatest flattest folding pushchairs I have come across. Not only that, but it feels robust. 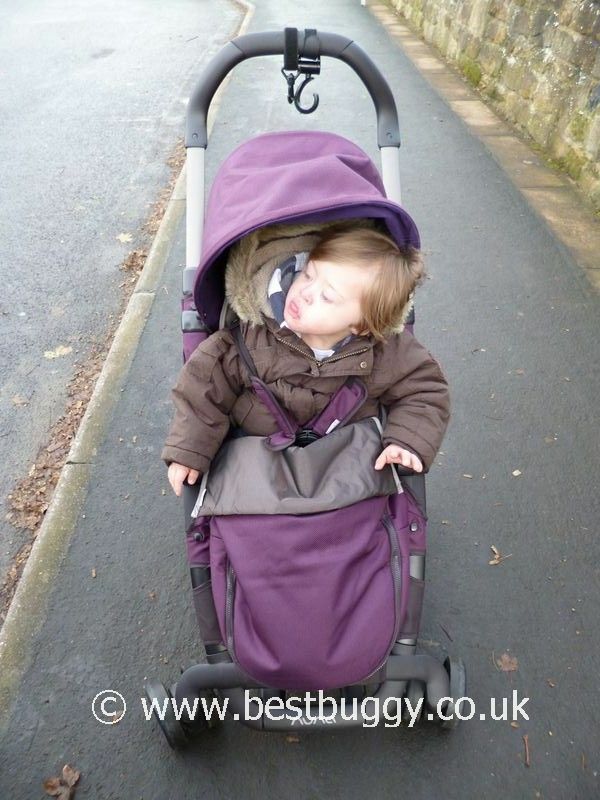 Absolutely brilliant pushchair apart from one seemingly minor flaw… but we were unable to live with it! The Nuna Pepp has a good sized seat. It isn’t the largest seat, but our tall almost 4 year old was riding around in the Nuna Pepp this summer and it held her weight well and all round it was great. The seat is firm but has just enough padding in. The seat isn’t tall, and the hood appears to be low, but the hood is easily removed for a taller child. The Pepp has a seat that is a good depth and a reasonable length from the knee to the footrest. The footrest is fabric on a bar which seems to work well. The seat has a board in the rear and the seat goes well upright. There are also two zip reclines – the second recline is revealed undeneath the first recline. With one zip undone, the recline is slight. With the second zip undone, the Pepp gives a flat recline which is supposedly suitable from birth, although I am not convinced I would put my newborn in the seat. Both my children look really comfortable in the Nuna Pepp. The hood is not the largest hood but it is enough. The front section can be locked into position on each side and the rear part covers the child when reclined, although it does seem a bit floppy when the child is sat upright. Hiding inside the front section is a flick out visor! Amazingly neither of my children have discovered it. My youngest can be a nightmare at flicking visors up and down. So thats great! The fabrics seem to be thick and good quality. The zips are easy to undo. 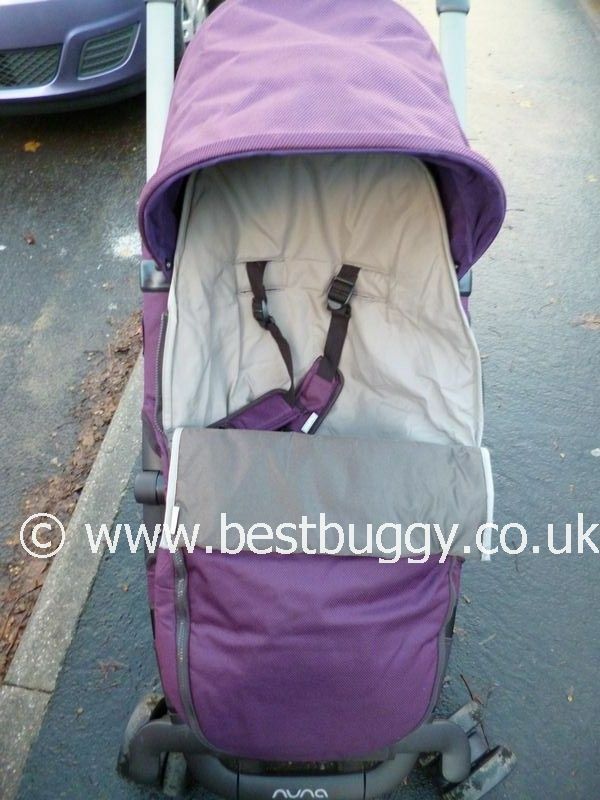 In fact all round the Nuna Pepp seems like a good quality pushchair. The Nuna Pepp comes in lots of fabulous bright colours! There is a 5 point harness on the Nuna Pepp, but it is literally a 5 point harness as opposed to a 5 point one with only 2 parts to fit into a buckle. Being honest, I HATE the harness……its now winter here, and I spent something like ten minutes trying to thread the 5 separate parts of the harness together in bitter cold just to keep my son safe. I tried to do one side, and put it in situ, but as soon as I moved the top part pinged back out again and I had to begin again. Absolutely and honestly it drove me nutty! I even contemplated swapping the harness but the waist straps are stitched into place. Someone on a forum only this week had a dig at a celebrity with a Nuna Pepp because her child only had 3 points of the harness done up but now I know why!!!! The harness is awful!!! This one issue for me spoils the entire pushchair. If ONLY Nuna would swap the harness then I would absolutely LOVE to have another Nuna Pepp. But sadly, this one feature will be the reason for us regretfully selling what is otherwise a fabulous little pushchair!! The harness is easy to undo and all 5 parts come undone as you pop it open do so which in some ways makes access much easier. There are harness pads and a crotch pad, all of which are well padded. The harness is a thick comfortable cotton type webbing. There is a choice of 3 harness settings. The harness is easily adjusted and there is enough room for our tall 4 year old in the harness. The crotch strap is nicely far back so avoid slumping. The brake is large, clearly seen, easily accessed and decisive! We love the Nuna Pepp brake. The Pepp has small double wheels at the front and small single wheels at the rear. 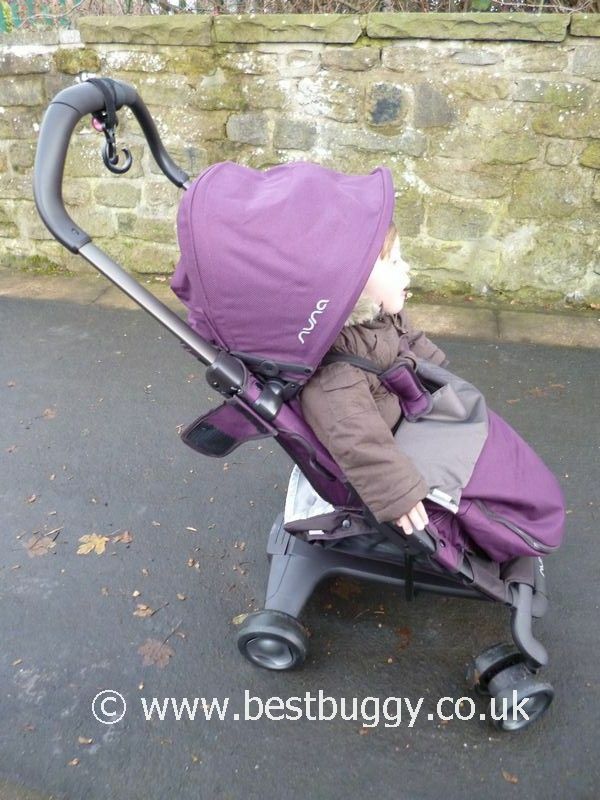 The wheels are splayed out to the side at the front which makes the Nuna Pepp feel very stable and secure when pushing. The manoeuverability is fantastic. The Pepp zips in and out of anywhere. It also feels very sturdy. There is no option to lock the front wheels and realistically the Nuna Pepp is best suited for an urban lifestyle although I am sure it would be fine in the mown grass of a park. There is plenty of suspension on the Nuna Pepp to offer both the child and adult a comfortable ride. It is perfect for me – not too soft and not too hard! The handlebar looks tiny when the Pepp is unfolded, but a lever on each side raises the handlebar up to the desired height which can be fairly tall. Its perfect for me at 5ft 6ins. I like the rubberised grip on the handlebar, and that it is one bar – great for one handed pushing! Useful when you have a toddlers hand to hold! It is neat to be able to fold the handlebar down eg in the nursery cloakroom or on a bus. The Nuna Pepp has a small, deep but adequate basket. It is enclosed on 3 sides, so access is via a small opening at the rear. Due to the boards in the seat and back, there isn’t much scope to squash items into the basket. My handbag won’t fit. However its possible to squash a coat or store the bare essentials in the basket. There’s enough storage for me for an outing. The Nuna Pepp has the strangest raincover ever! It comes wafer thin flat in a small pouch which then pops open to reveal a series of conjoined ovals. I will admit to scratching my head at this point and reaching for the manual! 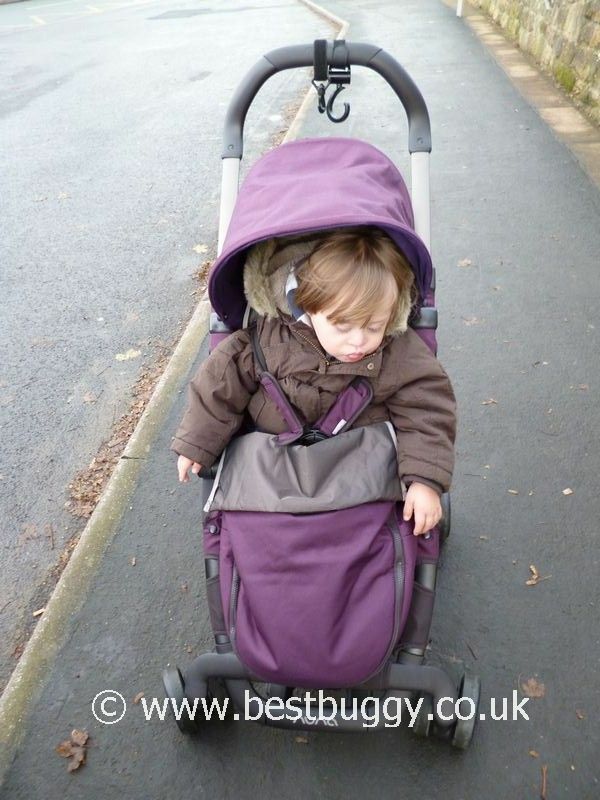 The ovals go across the pushchair – so one above the hood, and two across the front of the child. The lower two velcro fasteners wrap around the chassis in a gap in the fabric, and the other two velcro fasteners go through loops hidden underneath where the hood joins the frame. It is actually really quite clever and I got faster at putting the raincover on across time. We didn’t use the insect net, but we assume the principle is the same. The footmuff is made from the same sturdy fabric on the outside with a luxurious smooth almost suede feel inside. The footmuff fits on really easily and our 85.5cms 2 year old had enough room inside it. The Nuna Pepp is a pleasure to use. 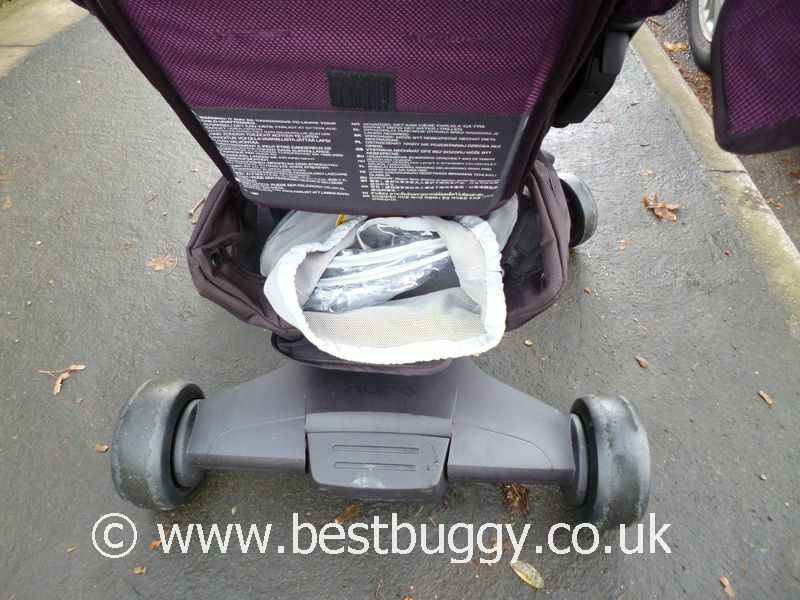 It unfolds really simply on handed - undo a velcro tab and pull the handle up and the pushchair clicks into place. Unfolding is just as easy. Fold the handle down, push the hood forwards until it is flat with the seat, and on each side below the hood are sliders. Slide these up and push the handle forwards and the Pepp simply folds in half, flat on the floor. Add the velcro storage tab, and the Nuna Pepp is then easy and light to carry. Two hands are needed to fold, but the movement is so quick that TBH you barely need to let go of a child’s hand – in fact you could probably still hold their hand and release the slide on one side. The Nuna Pepp freestands when folded! It can also be towed along. There is a travel bag for it too. The Nuna feels sturdy enough for me to consider taking it in a Nuna Pepp travel bag on an aeroplane. It would be a fabulous holiday pushchair. I have to say, the fold – both the ease of it, but also the size – is a huge selling point for me. The Nuna Pepp amazingly can be used as a travel system. It can take a Maxi Cosi Cabriofix car seat or the Nuna Pipi car seat with the appropriate adaptors. The fabric can be left on or removed. Leaving the fabric on means that the choice is there whether to use the car seat for a quick outing, or the seat unit for a longer outing. The hood does need removing but it is quick and easy to clip the hood on and off. The Nuna Pepp seat lies flat, so it is suitable from birth. There is a newborn insert available to make the seat more snug. My only issue with recommending this pushchair for a small baby, is that there is no leg support. Looking at the Nuna website, the footrest area should pop out to give a small baby some leg support, but our version for whatever reason doesn’t appear to do this. 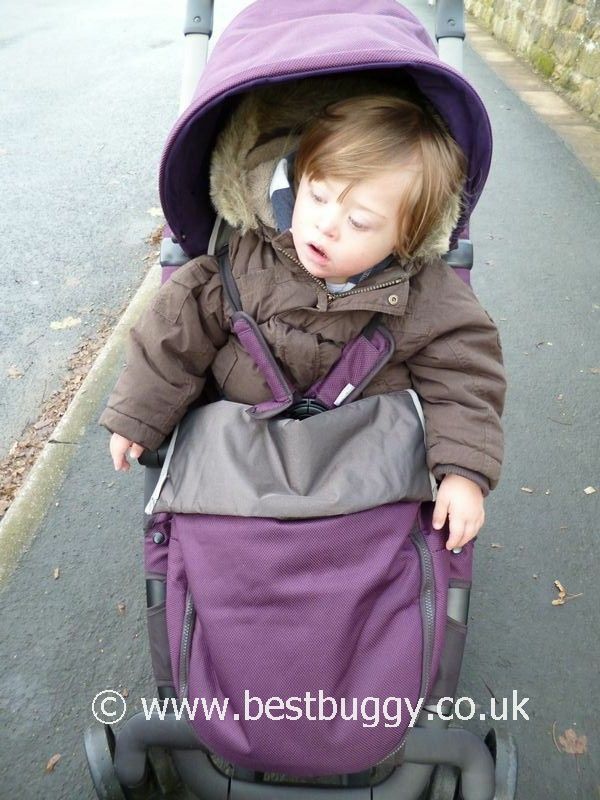 We pulled the pushchair apart and scratched our heads for ages over it! All round we love the Nuna Pepp. 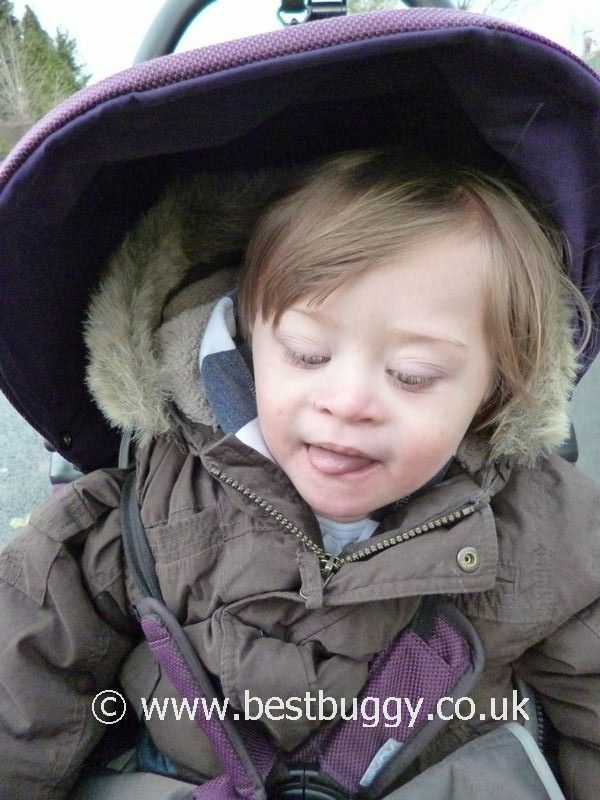 It is everything you could want and need from a small pushchair. Easy to use, great to push, easy to whizz around the shops with. Why have an umbrella fold pushchair when you can have a great looking Nuna Pepp??? The Pepp is just sooooooo neat and tidy. It would be fab on a bus, whether to be driven straight on, or whether to fold easily and carry on.